Kang Wang and Gavan Ring in Opera North’s The Magic Flute. 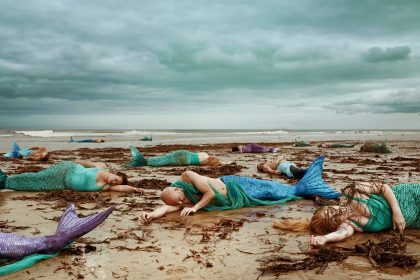 Photo: Alastair Muir. 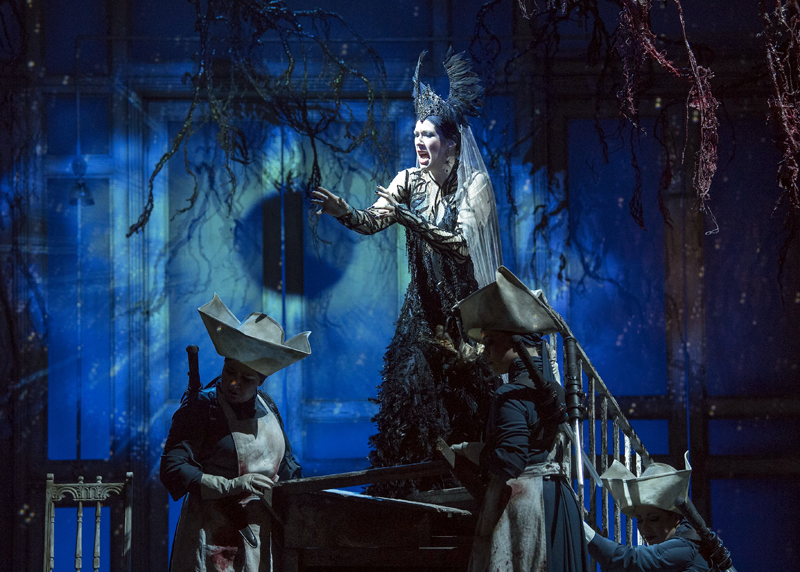 One of Mozart’s best loved works, The Magic Flute has everything you might wish for in an opera, throwing together extraordinary music with elements plundered from fairy tale, masonic ritual, Orientalism and street theatre. 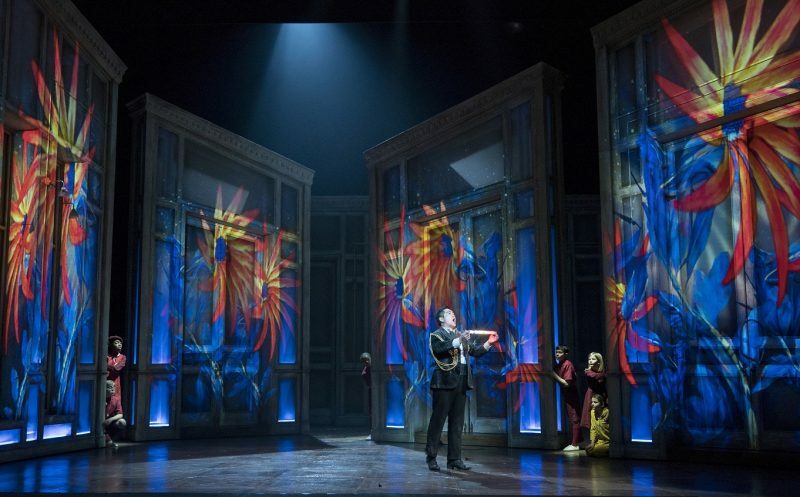 Colin Richmond’s continually mutable set emphasises the plot’s magical transformations and dramatic contrasts, whilst lighting and projection create delight and a real sense of magic. The dichotomy of night and day, embodied by Samantha Hay‘s Queen of the Night and John Savournin‘s Sarastro respectively, is that of female and male. The sexual politics of The Magic Flute are pretty reactionary (women need to accept the guidance and leadership of men, their words cannot be trusted, etc), but things are never quite that simple. Helen Évora, Kang Wang, Lorna James and Amy J Payne in Opera North’s The Magic Flute. Photo: Alastair Muir. Kang Wang‘s Tamino is rescued by the Queen of the Night’s trio of fierce hench-women. 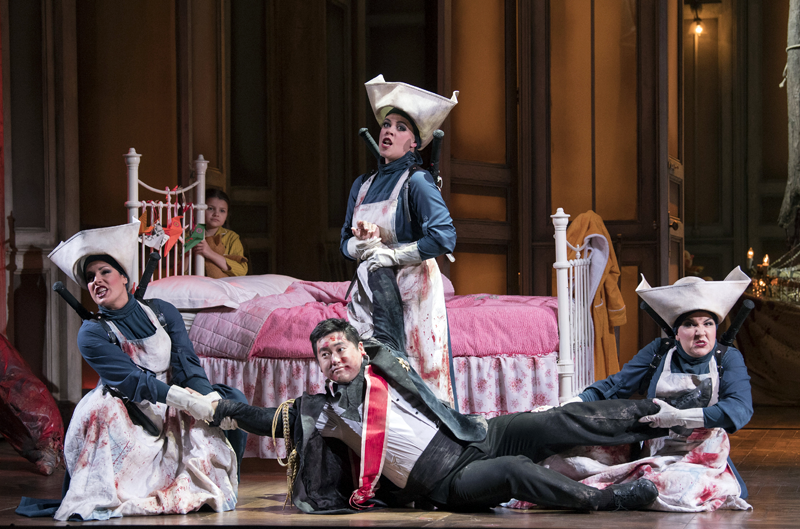 Armed with light sabres and wearing disturbingly bloodstained aprons, the three show a lively and decidedly carnal interest in the young prince. John Savournin in Opera North’s The Magic Flute. Photo: Alastair Muir. Sarastro, initially portrayed as an evil sorcerer, but subsequently realised as a force for good, entrusts Pamina to his servant Monostatos, whose intentions are as dishonourable as his appearance is repellent. He’s pretty authoritarian too – imprisoning Pamina, and imposing on her suitor a whole series of trials before he will permit them to be together. A modern audience is never going to be comfortable with the cult of Sarastro. However, if we initially root for the Queen, we quickly lose faith in her – and not because Sarastro tells us to – but because she disowns her own daughter for refusing to commit murder and promises her to the predatory Monostatos. Our contemporary sensibilities are also attuned to the subservience of the women in Sarastro’s temple. They set out the table for the council, but do not sit at it. They serve food and drink, but do not partake. And their red robes are very reminiscent of a certain contemporary fable about another patriarchal theocracy! Nonetheless, Pamina is a worthy heroine, every bit Tamino’s equal (according to some scholars, this was Mozart’s influence, countering his librettist Schikanader’s jovial sexism). One suspects Papagena too is rather more than equal to her mate. But never mind all that. From the very beginning, as a little girl in pyjamas puts on a record of The Magic Flute to prompt the orchestra to begin, we’re enthralled – by spectacle, by the inventiveness of the sets and magical effects, by the sheer playful creative energy of the work and, of course, by some of Mozart’s most wonderful music. The instrumentation is richly varied, incorporating the eponymous flute, Papageno’s pipes and the magic bells (represented by the celeste). The day/night contrasts are echoed in the voices of Sarastro – Savournin hitting low, low notes that resonate with authority – and the Queen of the Night – a bravura performance from Hay who delivers the famous aria with its fierce, staccato delivery and stratospherically high notes [her top F four octaves above his bottom F] magnificently. The two royal lovers are both new to Opera North. 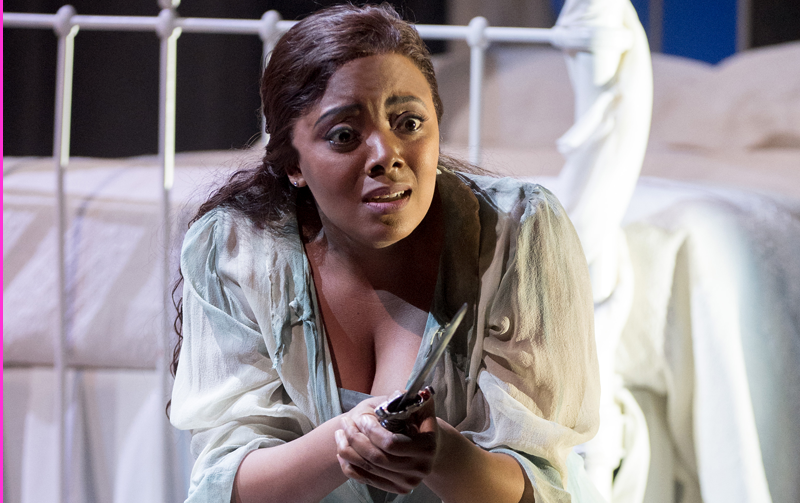 Vuvu Mpofu imbues the role of Pamina with warmth, passion and a gorgeously rich delivery. 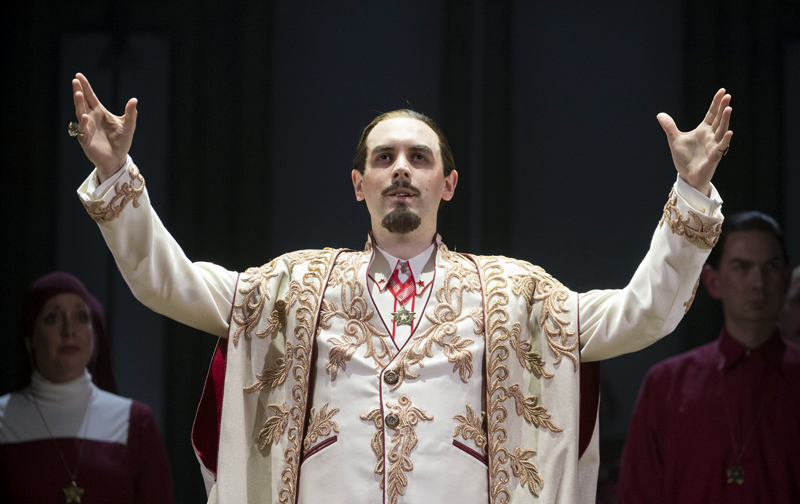 Wang as Tamino is a splendidly idealistic – if naïve – hero. Their more proletarian counterparts are beautifully played too. 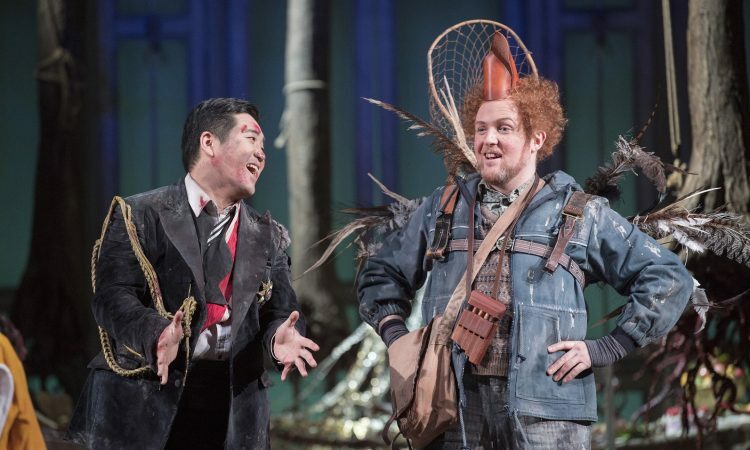 Gavan Ring‘sPapageno displays superb comic timing, but brings out the poignancy of the role too. Amy Freston, recently delighting audiences in both Trial by Jury and The Merry Widow, is an enchantingly bird-like Pagagena. That little girl in pyjamas wanders through the action – hiding when things get a bit scary, joining in with the other children as they chase and play. At the very end, as Sarastro proclaims victory of day over night, she and he share centre stage. Is she dreaming the whole thing? That isn’t made explicit, nor need it be. Perhaps she’s inspired by the girl in the audience on whom Ingmar Bergman’s film of the opera focuses, and to whom it keeps on returning. But this child is onstage, not sitting in the stalls. She is every one of us. Entranced, enchanted and swept along by the magic. Opera North’s The Magic Flute is at Leeds Grand Theatre until 1 March, after which it goes on tour to Salford, Newcastle and Nottingham. Details here. Read the culture vulture interview with set and costume designer COLIN RICHMOND here.